Metro Ortem Ltd. manufactures a wide collection of the best ceiling fans for home and offices. The range consisting of both big and small sized fans is manufactured for all room types, including, bathrooms, gardens and even entranceways. The continuous demand for better and best ceiling fans for houses has led to the innovation in the design, technology and production and the ability to meet that demand has diversified the market in the recent few years. The demand for stylish looking best ceiling fans for large rooms of homes and offices has increased by many times. Ever since Metro Ortem started manufacturing fans for home office, kitchens and other applications, it has continued to maintain international quality standards in its production unit, and today the company is not only the top 10 Ceiling fans brands in India but also the leading bulk exporters of ceiling fans to many countries outside India. 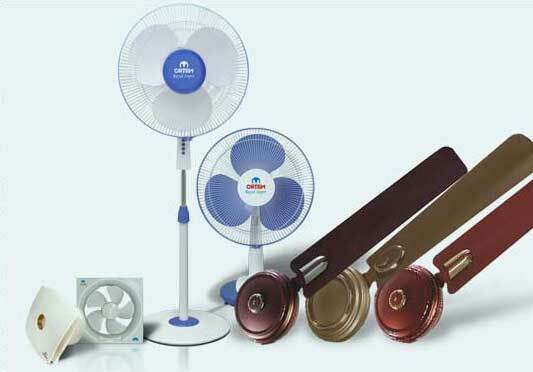 The variety and quality of fans at Metro Ortem is very wide, hence it is very easy for Ortem clients in houses and offices to get the right choice of high quality portable fans for rooms for their particular space. You can get your choice of colours too in all sizes from large fans to smaller ones. The Company follows industry�s best practices in each of its manufacturing, packaging and delivering processes. The factors that make ceiling fans still popular among masses are its value for money and above all, they save electricity consumption too. There is no big maintenance issue to handle the best ceiling fans for house made by Ortem as compared to air conditioner. Hence, ceilings fans are believed to be the best fan option for both home and offices. Be it the best ceiling fans in bulk for home, office, kitchens or for any other purpose, Ortem strives hard to exceed the expectations of its large customer base both in India and abroad with highly innovative solutions, offering people supreme comfort and complete peace of mind. Today, Ortem is perceived as an industry leader in India and counted among the most dependable ceiling fan companies list in India.